The fantasy-adventure series with the most convoluted back-story ever has returned. It started off as a spin-off of The Mummy 2, and was the first starring vehicle for Dwayne “The Rock” Johnson. Part 2 was a prequel starring UFC Champion Randy Couture and some guy who will allegedly grow up to be The Rock, and then followed by several more low-budget movies, each time featuring a different actor. Now Netflix presents part 5, and the sixth movie featuring Mathayus, The Scorpion King. Who doesn’t love fantasy films, high and low? Let’s check this out. You’d think by Part 5 of anything you’d have the main character nailed down, right? Nuh-uh. Not with the Scorpion King. Every time out he seems like a completely different person, and I don’t mean because he’s played by a different actor. I mean he’s a totally new character, with vague motivations, inconsistent skill sets and every movie is completely unrelated to what came before it. And let’s not forget that this generic fantasy hero started off as a VILLAIN, because the filmmakers have forgotten that. Instead of exploring a hero with shades of gray like an Elric, or Conan, he’s a vanilla dude with long hair and perpetual beard stubble. 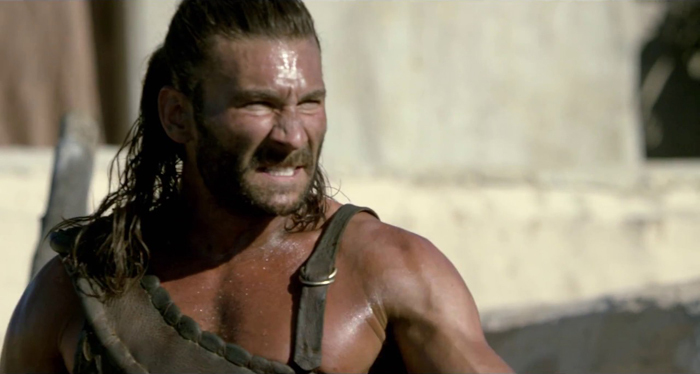 Here he’s played by side of beef Zach McGowan, who’s been in nothing I’ve ever seen. Apparently he was on The Walking Dead, but I don’t remember him. All you need to know about his career is he was in Dracula Untold playing a character named Shkelgim. Or maybe that’s everything you need to know about Dracula Untold. McGowan is fine, can deliver a line and is more quick and agile than the lumbering Rock but, you know, not as good in any way, shape or form. His character is totally generic, just like this movie. 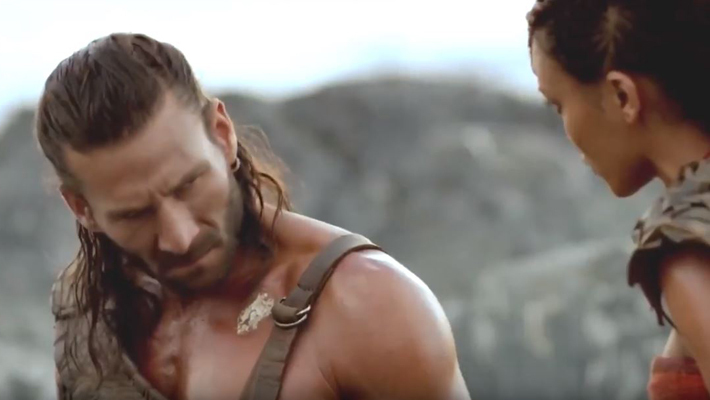 So for those keeping track, The Scorpion King is Mathayus, an Akkadian, who seems to live in a Conan-adjacent desert world. And what exactly is an Akkadian, you may ask? I know, I did. Apparently it was an empire that ruled Mesopotamia between the 24th and 22nd centuries B.C. That’s a long time ago. Long enough so that all rules of historical accuracy can be ignored and any accent is fair game. And this being a fantasy film, there’s your typical sorceress, magic glowing sword, Book of Souls and a big lumbering golem. The golem is played by big, lumbering, muscled guy Nathan Jones, and sadly the golem is a total wimp and looks like a reject from GWAR. He’s supposed to be a big, rock dude, but he looks rubbery and feather-light and he’s afraid of fire. A rock dude afraid of fire, that’s a special kind of ridiculous. And he looks like any of the terrible screen versions of Fantastic Four’s The Thing but, you know, even worse. One of the positives here is a multi-racial cast including mega-babe Pearl Thusi as a Nubian Princess, the filmmakers’ only nod to a historical reference, and Nigerian-born actor Peter Mensah, who is menacing as the Thulsa Doom-like villain, even before he gets glowing eyes and a magic soul-stealing sword. Of course, he’s given nothing to do the entire movie. Couldn’t we have a court scene where he orders the murders of innocents? Or maybe monologues about just what the hell he’s trying to accomplish so that Mathayus and the audience have a clear goal that needs to be achieved? That would be nice. 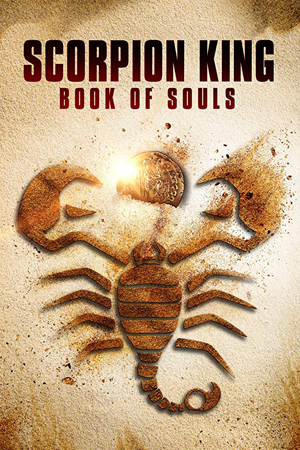 The thing is, I’ve been disappointed by every single Scorpion King since the Mummy one. Well, everyone was disappointed by the CGI embarrassment of The Mummy 2. This world should be interesting. They could explore Middle-Eastern mysticism or make veiled socio-political commentary on the war in Iraq and the Middle East, or just go crazy with it, making up crazy new stuff. Instead, they do none of that and they just do dull, generic adventure stories. Ho-hum. I will try to describe the plot now. Not-Thulsa Doom and his multi-ethnic “barbarian” band find a magic soul-stealing sword that allows them to take over the world. I say “barbarian” because that’s a Roman term for anyone who didn’t speak Latin, and as we all know, Latin won’t exist in this world for 2000 more years. Then the plot Conans it up with Mathayus’ village being attacked by the marauders. He’s the Scorpion King, but for some unexplained reason he’s hanging out in this backwater village as a blacksmith giving his son the Riddle of Steel speech. For no reason except that it was cool in Conan The Barbarian. Mathayus’ wife and son are murdered by not-Thulsa Doom, which doesn’t effect him at all. Sure, he’s a bit mopey and doesn’t want to get involved in the adventure, but he should be burning with fury for revenge, like in one of the greatest fantasy films of all time, Conan The Barbarian. 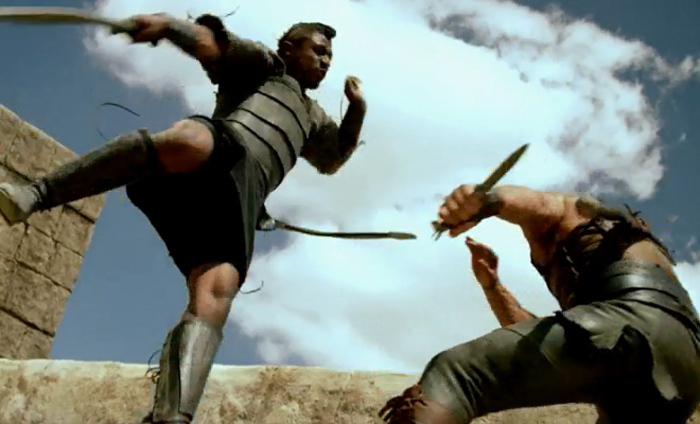 Mathayus is saved when the Nubian Princess has scorpions sting him. Then they go on a long, pointless adventure involving getting captured a few more times and wandering the countryside. Then, because the screenwriters have no idea how to end this thing, they have Mathayus get captured yet again by not-Thulsa Doom so they can have a bad sword fight, roll credits, the end. The only thing that should matter in these kinds of movies is if they have awesome fight scenes. Sadly, the fighting is the bloodless punchy-kicky style of swordfighting favored by Xena: Warrior Princess. So no, I don’t recommend seeing this movie for the fight scenes. There’s one parkour sequence where Mathayus fights a bunch of dudes on the walls of a city and they run at him one at a time. That one’s okay. He dodges a bunch of arrows in slow-mo, which is a nod to the original non-Mummy Scorpion King. Just to illustrate the level of writing in this flick, Generic Bearded Thug tells Mathayus, “You will bleed.” And the Scorpion King’s weak reply is, “You will die.” Wow, he’s definitely not The Comeback King. I did get a chuckle when the good tribal leader says “Unleash Hell” just to feebly steal from Gladiator and because the movie is set 2,400 years before heaven and hell were things people cared about and believed in. It’s never a good sign when I’m doing an image search for the movie and there are FAR more shots of the actors goofing off on set than memorable moments from the actual movie. I watched Scorpion King 5 with glazed eyes over several days. I never could get into it. Unlike in great fantasy stories, you are never swept up in this wondrous world. The story never goes anywhere, the TV-series level swordfighting is weak and the final battle is rushed and stupid. McGowan is adequate as The Scorpion King, but the Scorpion King is the weakest part of these movies, which is sad. If you’re going to devote six movies to this guy, at least give him some sort of characterization that sets him apart from a long line of leather pants-wearing beefcakes who star in these kinds of movies. I suggest watching Conan The Barbarian again and see how Arnold Schwarzenegger, despite limited acting skills at the time, totally commands the movie and creates an indomitable screen presence that is often imitated, never replicated. SPOILER ALERT: Mathayus defeats Not-Thulsa Doom by using some ordinary chain to toss him about a mile through the air in slow motion into the computer generated Pit of Eternal Fire. It looks completely ridiculous. Who thought that was a cool way to kill your main villain? 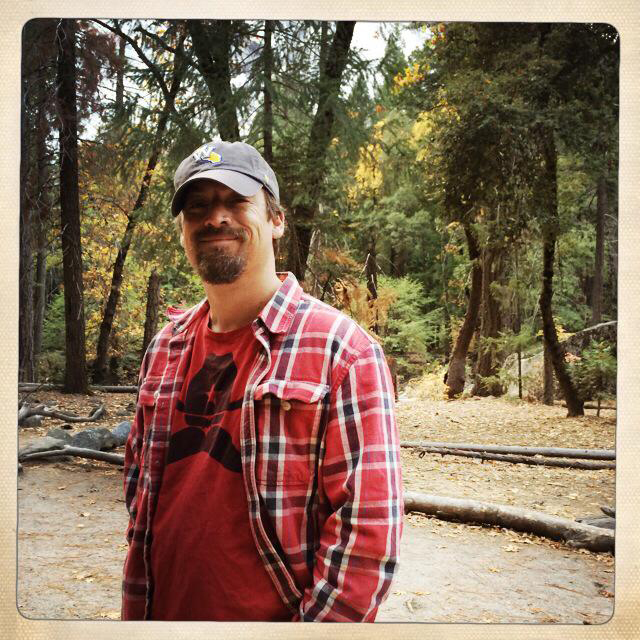 Director Don Michael Paul did, and he deserves most of the blame for this movie sucking.